I have a huge problem with salads, it's called an odd over compulsive craving for them, all the time! I just can't get enough! They are hugely satisfying, fresh, crunchy, creamy, and bursting with flavor. Oh and all the possibilities!! 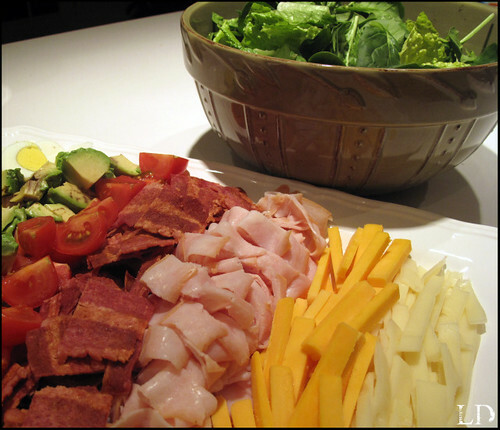 Here is one of my favorites, my version of the classic Cobb Salad. 1st boil your eggs for about 10 minutes until they are cook through, rinse with cold water and set aside to cool. Once cool slice your hard boiled eggs. Slice your lunch meat and both cheeses into thin strips. Cook your turkey bacon according to directions on package and chop. Slice your cherry tomatoes into quarters. Slice your ripe avocados then cut into chunks. Assemble with fresh romaine and top with blue cheese dressing. Oh man, I am soooo hungry now! LOL :) Definitely going to have to try this! place. sooooo yummy. Quite easy. Cheers for this.